Home shoppers usually want to see a property at its best. This means that sellers truck in staged furniture, slap on fresh paint, and repair potential problems for buyers. “When you walk into a beautifully designed and furnished unit, people can much more easily place themselves in this atmosphere,” says Jade Mills, a real estate agent at Coldwell Banker in Beverly Hills. However, there’s an entirely different alternative that home sellers are trying. 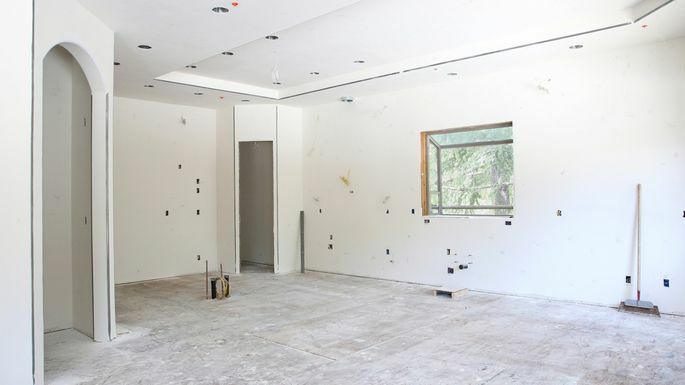 It’s called “white-boxing.” Home sellers—especially those in luxury markets with high-end properties that are in great locations—are ripping out everything in a home before showing the property. As counterproductive as this may sound, white-boxing lets prospective home buyers start from scratch. It allows them to focus on potential and maybe even the views outside the residence, rather than what’s inside the home, which may not suit their tastes. “White-boxing” is the exact opposite of staging a home to enhance its appeal. Instead of using furniture and accessories to sell the space, it presents a blank canvas, without the aesthetic choices in place, and allows the buyer to dream up layouts and floor design. White-boxing is most relevant in luxury markets like New York City and Los Angeles, where breathtaking views and a desirable location are common selling points of a house, Mills says. “As recently as a few years ago, it would be relatively rare for a seller to go to market with unfinished luxury space, but now, there’s increasing recognition that ‘designer-ready’ is exceedingly more attractive than ‘move-in ready’ to the ultrawealthy,” Josh Greer of Hilton & Hyland told CNBC. One case in point was a penthouse apartment in the Park Slope neighborhood of Brooklyn, NY, that was listed for nearly $3.5 million, a high price even in a coveted location where the median listing price is $1.6 million. The three-bed, two-bath property has 360-degree views of all New York City boroughs, but was in serious need of new plumbing, which meant the floors would need to be ripped up. Rather than restoring the interiors, the seller decided that it made more sense to white-box the penthouse. The strategy worked—the home is currently under contract, with a closing expected this month. The key to the successful sale? Listing agent Scott Klein says it’s tied to buyers being able to dream up their perfect home. When they came to tour the empty house, buyers were given an iPad with a virtual reality tour that allowed them to explore the house and view potential floor plans. It gave them a better sense of what the apartment would feel like after it had been completely redone. White-boxing definitely isn’t for all properties and buyers. Most home buyers like to see a home in good condition. That’s one reason why home staging is a popular tool many sellers use when marketing their home. White-boxing, on the other hand, isn’t about improving aesthetics. It’s about playing up the value of the location and giving home buyers the freedom to use their imagination. One major drawback of a white-boxed property is that the buyer can’t move in immediately. It might take even more than a year to move in, depending on the amount of work that needs to be done. That said, any buyer who plans to gut the house and put their customized touch on it will appreciate a white-boxed property. Why? A demolition crew has already completed the work of tearing down walls and clearing the place out. That can save the buyer thousands on demolition costs and allows them to start designing the new space immediately. Should you white-box your property? If you’re considering the idea of white-boxing your house, there has to be something about the property that will get a buyer to overlook the condition of the home, such as its great location, breathtaking views, or top-ranked school district. Mills says a home that needs significant repairs (i.e., a fixer-upper) may be an option for white-boxing. But showing properties in poor condition isn’t easy. A buyer may focus more on the problems rather than the potential. Hopefully, though, if everything is removed and the home is in an enviable spot, the buyer will concentrate on the possibilities.